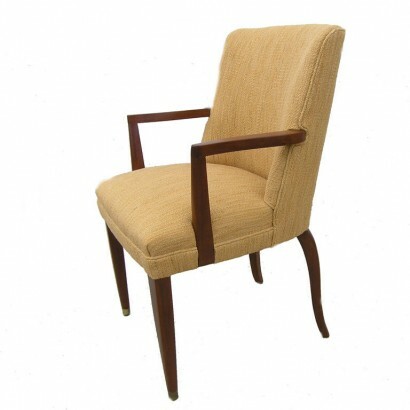 United States, 1940s This rare Edward Wormley side chair features a curved caned backrest. 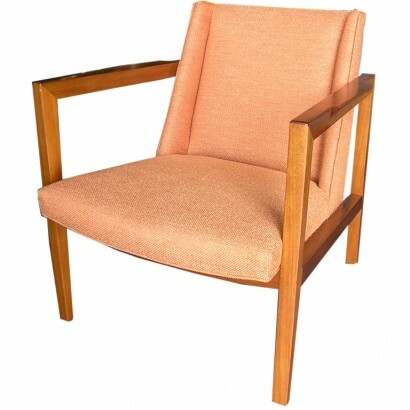 The mahogany frame offers a solid and supportive seat. The frame is in excellent condition. United States, 1950s The eight drawers of this solid walnut dresser by Edward Wormley form an elegant asymmetry that is emphasized by the inset brass ring pulls. The sides feature bold overlapping finger joints. 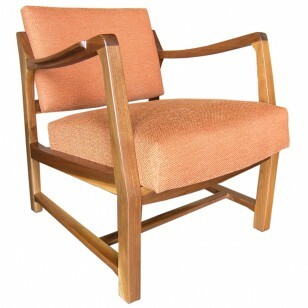 USA, 1950s This pair of chairs was designed by Edward Wormley and manufactured by Dunbar. 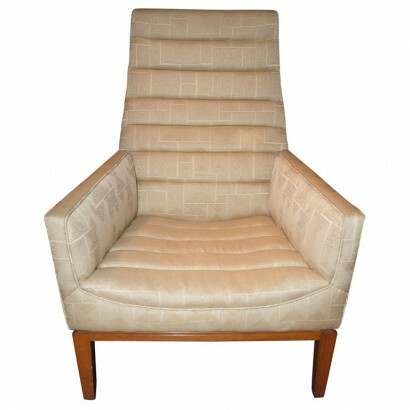 They features expertly refinished walnut frames with seats that have been newly reupholstered in supple brown leather. USA, 1950s This coffee table was designed by Edward Wormely and manufactured by Dunbar. It features a burl wood reuleaux triangle top on a mahogany base with brass-capped feet. Original label on underside. USA, 1950s This table was designed by Edward Wormley for Dunbar in 1947. 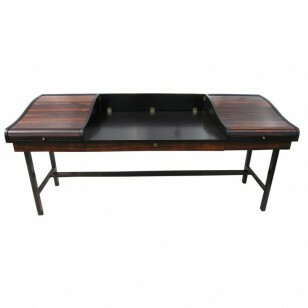 It is constructed of light mahogany and features subtle Asian design details. The table includes two 24″ leaves that allow it to extend up to 100″. USA, 1950s This beautiful tea cart has a sculptural elegance. With both leaves extended this piece measures 49″ wide. Featuring two removable trays and a unique inlaid glass top, this tea cart is as attractive as it is functional. 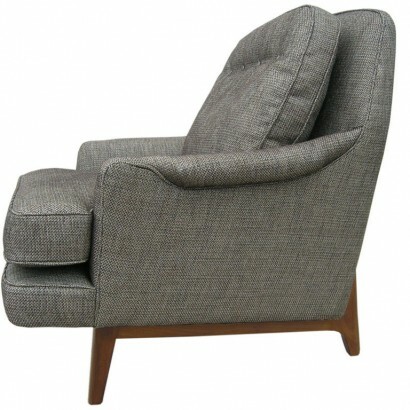 United States, 1950s Edward Wormley designed this deeply comfortable armchair for Dunbar. 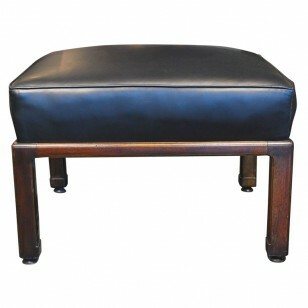 The boxy leather-clad seat rests on a slender rectilinear frame of mahogany. The chair has been upholstered in a beautiful warm red leather. One available. 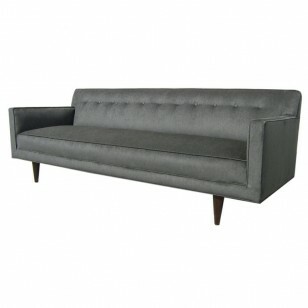 USA, 1950s Edward Wormley designed this mid-century headboard for Dunbar. Louvered panels of light mahogany create clean but strong lines that extend the width of a king-size bed. USA, 1950s Each bookcase in this pair by Edward Wormley features three shelving areas and two shallow drawers. USA, 1960′s Rounded-edge square plane of glass sits atop the sculptural bronze base of this coffee table designed by Roger Sprunger for Dunbar. USA, 1960′s This “Sheaf of Wheat” table was designed by Edward Wormley for Dunbar. It features a travertine top and a mahogany base. The original tag is on the bottom of the base. USA, 1950′s Another well designed and practical piece by Edward Wormley. USA, 1950s This pair of chairs is upholstered in a beautiful crewel textile. 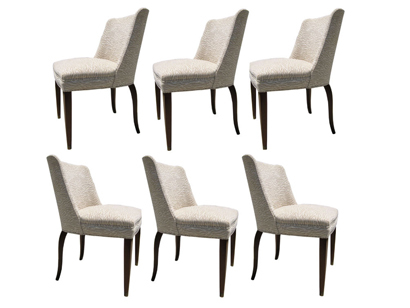 A down-filled loose cushion on each chair adds to the comfort. USA, 1950′s This beautiful tea cart has a sculptural elegance. With both leaves extended this piece measures 49″ wide. Featuring two removable trays and a unique inlaid glass top, this tea cart is as attractive as it is functional. 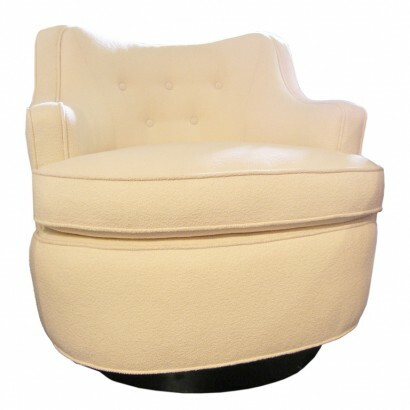 USA, 1950s This darling pair of diminutive armchairs are ready to be upholstered in the textile of your choice. 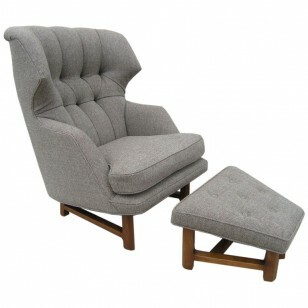 United States, 1950s These classic armchairs are very comfortable. 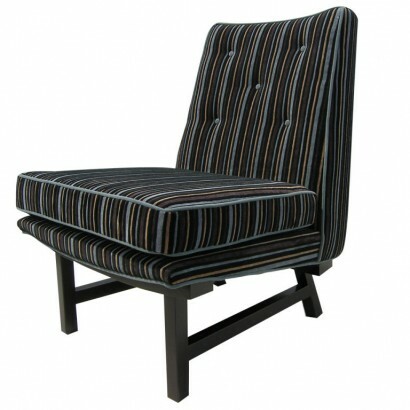 Ready to be reupholstered in the textile of your choice. USA, 1950s Beautiful two-tone headboard to fit a King or California king bed. 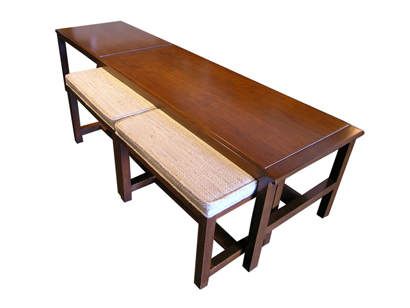 USA, 1950′s This elegant coffee table features two nesting stools and a sizable magazine rack. Stools measure 19.5″L x 12.25″D x 13.5″H. 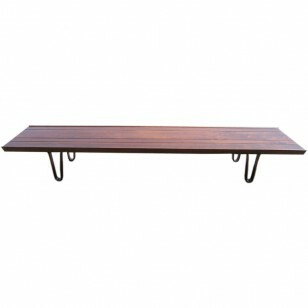 USA, 1950′s Beautiful long low walnut coffee table/bench with bent wood legs by Edward Wormley for Dunbar. USA, 1950s Edward Wormley designed this roll-top desk, model 912, for Dunbar in 1957. 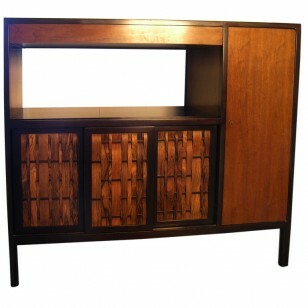 Flanking the spacious central writing surface, rosewood tambour doors conceal two smaller sections each with two drawers. Below are three additional, shallow drawers with rosewood fronts.